Something Worse Then The “M” Word? | Just Create! Something Worse Then The “M” Word? As a knitter and someone that loves working mainly with natural fibers, one of the scariest words that can be uttered around a yarn or hand-knit stash is the “M word” – Moth! They are well known for their love of wool, eating through fibers, leaving small holes in the fabric or spots in the yarn where it is either broken or weakened enough knitting becomes nearly impossible. Knitters have dedicated time and research into what to do if they take in acquired stash to keep their own stash clean, how to eradicate the pesky things and what to look for to make sure their stash is safe. I have been lucky so far and have avoided having the “M word” show up in my house. And I was feeling pretty good about it. Until I found something far worse than the “M word”! It is the “S word” – Spike!!! Yep, that little guy there. Now, don’t let that cute face fool you! He is a cutey. He is my mom’s baby, in fact. A year ago, he was born under a hosta and abandoned by his mom because she was scared off by workers around the house. My mom and her husband picked him up and took him in. He was hand raised by them – even bottle fed. 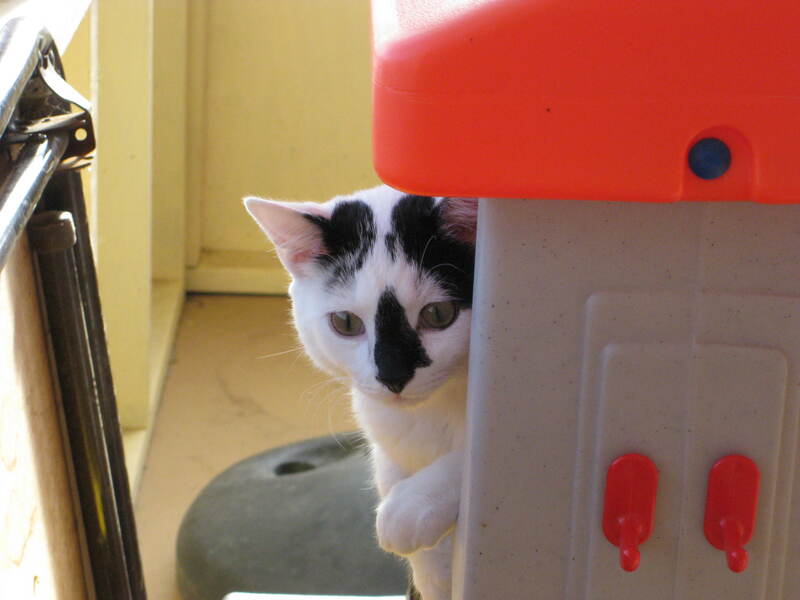 He is spunky and silly. And he has a thing for my knitting! Our first clue was the day I brought a bag of knitting to the house when I came to visit. My mom and I walked out of the house to do something and when we came back in, a ball of my yarn was strung clear across the house, from one side to the other. It was wrapped around chair legs, under the couch and we finally found it under the bed. We laughed and thought it was hysterical. Then it warmed up and I didn’t knit much, so I didn’t bring much to the house. But then fall hit again. My son wore his hand-knit sweater to their house and Spike would often be found dragging it off, or the sweater would be in a strange place when I finally located it. One day, at home, my son put the sweater on and I noticed a large hole in the sleeve. It covered 4 rows and 4 columns of stitches! I couldn’t figure out what my son had caught it on to cause such a large hole, but I patched it up and forgot about it. Then I decided to wear my hand-knit sweater when we visited. I took it off and left it in a dining room chair. Suddenly, we heard a noise and my sister started laughing. Spike was attempting to drag off my thigh length wool sweater! He managed to get a sleeve under a bed before we rescued it. But, it was too late. 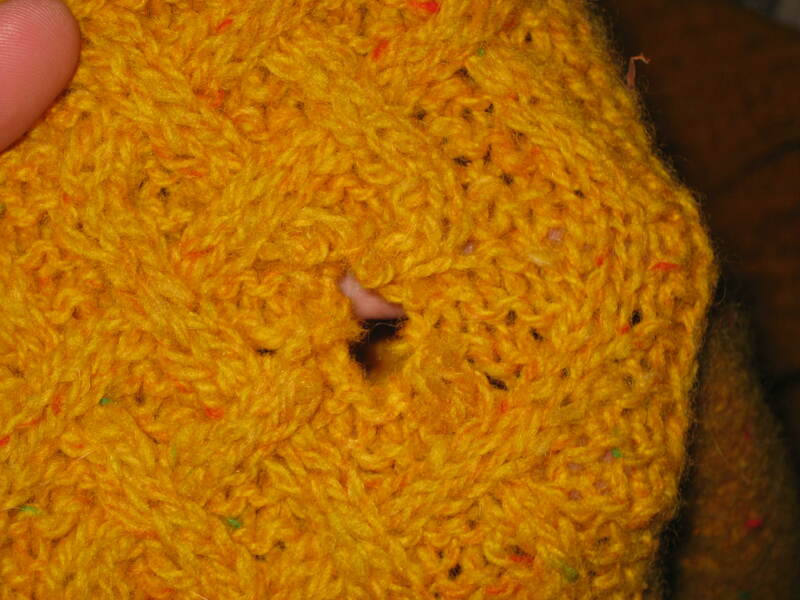 In the cabled cuff of one of the sleeves, he managed to make a hole. In the picture below, you may notice that the hole is right at the intersection of the cables. Yea, right at the crossover. The sweater came home with me and was put away. I have yet to deal with the hole. I’m not really sure how to deal with the hole! Of course, I didn’t learn my lesson. I wore a hand-spun, hand-dyed, hand-knit scarf over one day. My mom walked in the dining room where the scarf had been stuffed in the sleeve of my coat and found Spike trying to drag off my scarf! He had managed to get into the coat and pull it out, even though the heavy coat was folded over and the sleeve was hidden. I walked in and he was walking down the table with the scarf in his mouth. I tried to get it away from him and he gave me a warning cry. He was determined to keep that scarf! My mom finally managed to get it away from him, but he was NOT happy about giving it up! We immediately inspected it and found a hole in the bottom. It was about then that I realized what actually caused the hole in my son’s sweater. I have yet to mend the scarf. 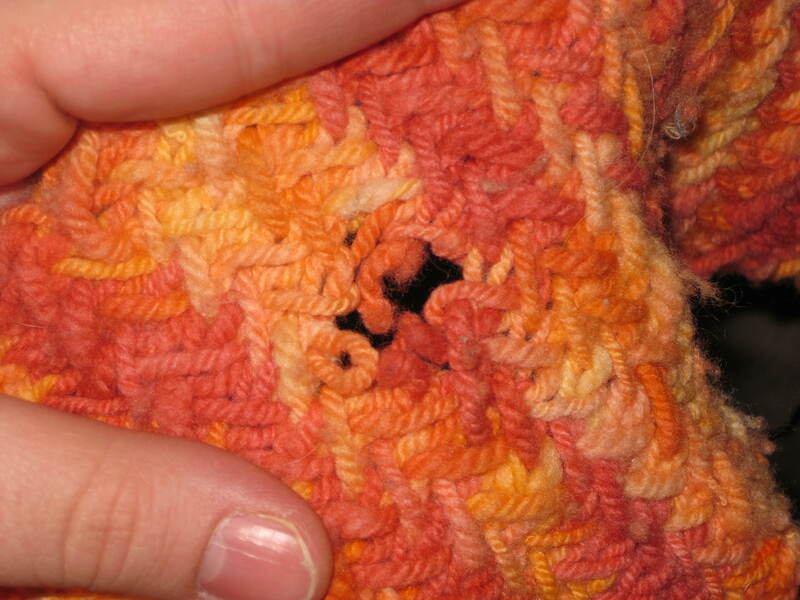 It is a different stitch pattern that also would prove difficult to mend. Since the damage is near the cast on edge, I am thinking of simply frogging the whole thing and starting over (one of the perks of being a knitter!) I wish I could reknit the cuff of my sweater, but that just won’t work. So, I will try to mend it and keep hand knits away from Spike! Spike Strikes Again! « Just Create!